Many people could do transcription from home but don’t have any experience. Here are five jobs that let “newbies” go to work right away. 1. Get Transcribed hires Transcriptionists without an experience requirement. They do ask for a 60 wpm error-free typing speed (you’ll take a test at TypingTest.com), and English has to be your native language. You’ll need strong grammar and spelling, but that’s true for most transcription jobs. Pay is 25 cents per minute of audio, via PayPal. To go straight to the job, click here. 2. Speechpad is recruiting new Transcriptionists, newbies welcome. Their client list includes Netflix, Amazon, and many more. Per Speechpad, most of their 5,000+ Transcriptionists are in the US. Transcribers receive an ongoing rating score as they finish assignments, and the higher the score, the more work they’re offered. Pay reportedly varies depending on the assignment you take. Click here to sign up. 3. CastingWords has simple instructions for Transcriptionists: Sign up, work, get paid. You can find assignments on Amazon’s Mechanical Turk or through the CastingWords site. Per the company, jobs via its site pay 20% more. Pay varies depending on your rating. For FAQs, click here. For more detail, click here. 4. Rev.com, a growing venture capital-funded company, has been hiring work from home Transcriptionists for several years. You’ll often see their job ads online. Pay is $0.40 – $0.65 per audio minute. The company says it’s average earnings for Transcriptionists is $241, with a high of $1,495. To apply, click here. 5. Transcribe Team is a Virginia-based company that has also been hiring Transcriptionists for years. There have been periodic complaints about workflow and low pay, but if your goal is to get experience and increase your rates, it can still be an option. Per the company, the range of pay is $0.40 – $1.25 per audio minute, with average monthly earnings of $132 and a top of $2,282. For more, click here. 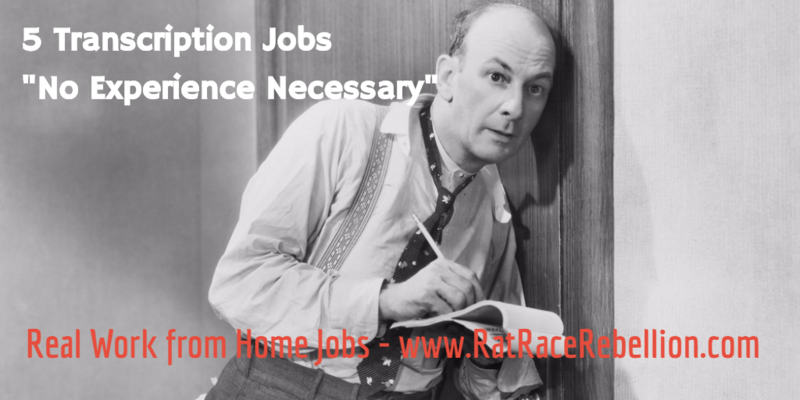 For more Transcription jobs, go to our Transcription Jobs page. This entry was posted in Crowdsourcing, Transcriptionists (Non-medical) and tagged CastingWords, Get Transcribed, Rev.com, Speechpad, Transcribe Team. Bookmark the permalink. ← 10 Delivery Jobs – Put Your Car, Bike or Scooter to Work for You!